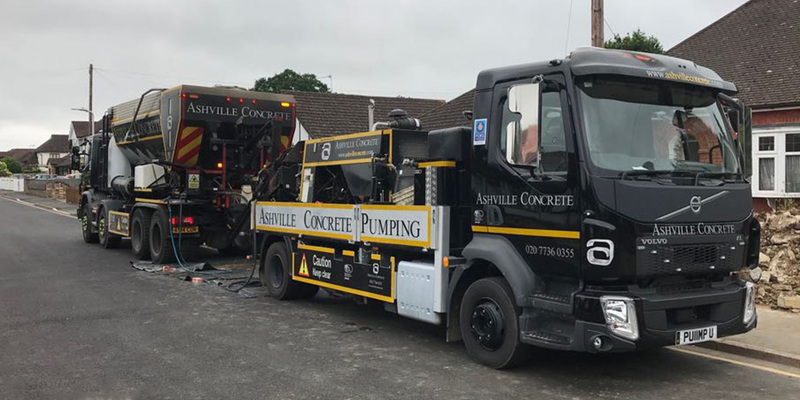 At Ashville Concrete we provide the opportunity for all of our clients Concrete Pump Hire. Our Concrete Pumping fleet has both Line and Boom Pumps, which gives us the ability to serve commercial, utility and domestic clients. Commercial projects can use both our line and boom pump services. Line pumps mean that one of our operators to reach footings or underpinning areas to the rear or lower levels of the site. Boom Pumps can be used to create slabs on elevated levels or just to reach an inaccessible location. Our Utility and Highway clients often use line pumps when reinstating Public highways. Generally a C35 – C50 Ready Mix Concrete mix is used. Concrete Pump Hire is charged for using four hour intervals. Thanks to this one of our operators can set up to serve the projects requirements and allows for multiple pours. We can generally offer service the same or next day. We operate 24 hours per day, 7 days a week. We are also incredibly passionate about the environment here at Ashville Concrete and we pride ourselves on our commitment to ensuring our carbon footprint remains as low as possible. Every one of the materials that we use are from environmentally friendly sources so you can be sure that your delivery of high-quality Ready Mix Concrete and Screeds comes from a responsible source. We offer Concrete Pump Hire Amersham alongside Ready Mix Concrete Hire Amersham,When booking you will need to ensure you have adequate access for the vehicle. Our fleet and pumping equipment is state of the art and regularly maintained. We are incredibly proud of all of our fleet and our achievement of FORS Gold status. All our vehicles have been installed with the very latest safety equipment and are tracked to ensure we know where they are at all times.